All the noise last summer surrounded France after winning World Cup in Russia, with Les Bleus comfortably the best team after defeating a brave Croatia side in the final. Paul Pogba, Kylian Mbappe and Antoine Griezmann lit up the tournament, but the French now have some new stars, and world champions too, with Corentina “Maestro” Thullier and Lucas “DaXe” Cuillerier striking gold at the first ever FIFA eNations Cup. The eNations Cup saw two FIFA professional gamers from 20 nations across the globe, with one player on PlayStation 4 and the other on Xbox One. In the group stage, each player would face their opponent on their console, before joining up with their teammate in a 2v2 contest. This console would be decided by an agreement between the teams or by the toss of a coin. The 2v2 tie would only feature in the knockout stages if there was no clear winner after the PS4 leg and Xbox One leg, regardless of aggregate score. Like the FIFA Global Series major tournaments, the players had access to any player or Icon on FIFA Ultimate Team, so the likes of England and Mexico could field the likes of Cristiano Ronaldo and Ruud Gullit in their squads. 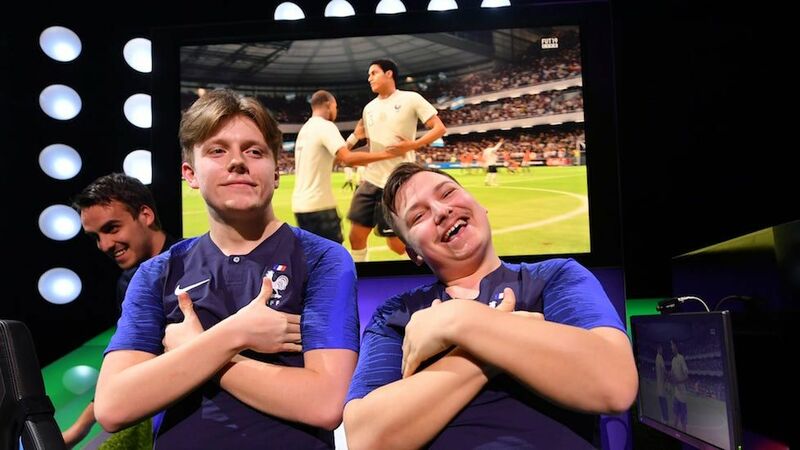 France took down a very game Argentina 3-2 in the final, with the French among the favourites given the recent form of both Maestro and DaXe in the FIFA 19 Global Series. Maestro, of Team Vitality, is ranked the sixth best player in the PS4 rankings, whereas PSG man DaXe sits fifth on the Xbox side of things. Both players claimed 1,500 FIFA 19 Global Series points each and split the winnings of $40,000. Maestro met world number 1 PS4 player Nicolas “nicolas99fc” Villalba in the first leg, but it was a cagey affair with the score 0-0 at half time. Maestro dominated possession of the ball, but it was Nicolas who struck first, with Raphael Varane tapping in the rebound following a corner. The equaliser came 15 minutes from time however, with a set piece finding the head of Cristiano Ronaldo to tie things up for Maestro. With the scores at 1-1, it would be a winner takes all in the Xbox leg between DaXe and Yago “Yagocai” Gabriel Fawaz. Fittingly the lead went to France and DaXe through the golden boy Kylian Mbappe, firing hard across goal. Yago came back fighting, but DaXe held out until the break. That was a crucial period of the tie, even more so as France went 3-1 up as DaXe fired in through Neymar. The response came through Yago’s Neymar, and we had a grandstand finish on our hands with half an hour to go. A French defensive error went unpunished, and soon after Yago had a big penalty claim turned down, enabling DaXe to hold on and take the tournament victory. Argentina reached the final after overcoming Denmark, who consisted of two former eClub World Cup champions in the form of Marcus “Marcuzo” Jorgensen and Faith “Ustun” Ustun. Marcuzo came out of the traps flying against Nicolas with an easy tap-in for Neymar coming after just six minutes. Nicolas, dubbed The Iceman, kept is cool and responded instantly, as Mbappe smashed in to the top corner. The pair continued to exchanged blows as Mbappe now poked one in for Denmark, but the same player bagged a further two for Argentina to give them a 3-2 lead. Yago doubled the advantage on the Xbox leg when a deflected shot was only parried by David De Gea and Neymar gobbled up the rebound against Denmark’s Ustun. The PSG star put one foot in the final for Yago, as Neymar went on to hit a hat trick and give Argentina a 6-2 advantage. One was pulled back by Ustun thanks to the R9 Ronaldo and there was even time for a late consolation as he went round the goalkeeper with the forward. Maestro was fired up for his semi-final clash against Rasta “RastaArtur” Artur of Portugal, and it was the Frenchman who got the early goal through Neymar. A big chance in injury time came Rasta’s way, but a big save from David De Gea ensure France had the advantage going into the Xbox leg. Diogo “tuga810_” was the man waiting for DaXe and things were made interesting as he tied things up at 1-1 early doors due to their main man Cristiano Ronaldo. DaXe kept his emotions in check and a smart turn in finish from Neymar made sure Les Bleus edged back ahead. Then, a key moment. Tuga produced a rash slide tackle in the box, giving away a penalty and seeing Sergio Ramos sent for an early bath. The spot kick was saved, but a man down, Portugal couldn’t threaten the French defence. The upset of the day came as England bowed out to Argentina, with the ‘eLions’ having the number one Xbox player in the world in Donovan “Tekkz” Hunt. He was joined by Tom “Tom” Leese, and it looked as if the PS4 man had done enough in drawing his leg with Nicolas. Few expected Yago to put up much a fight against four time FUT Champions Cup winner, eClub World Cup champion and ePremier League holder Tekkz. A shock 2-0 win for Independiente’s Yago meant they were no a serious threat for the title. Maestro showed his class in the first leg of the first leg of the quarter-final against Brazil, seeing off Victor “Tore” Santos 4-1. DaXe just had to keep Ebio “Ebinhob” Bernardes at bay, but that was easier said the done. The game toed and froed, but the Frenchman held on to a 2-2 draw, which was enough to take them through to the last four. Mexico and Denmark were going neck and neck as in the first leg Luis “Villamore3” Villanueva played out a thrilling 3-3 draw with Marcuzo on PS4. Beto “Beto19Avila” and Ustun also exchanged blows in a 2-2 tie, sending things into the third leg. With the decider at 1-1, Neymar got the winner for the Danes, smashing the ball in at the near post after a defensive mix up. The only clash to go to penalties came between local rivals Portugal and Spain, as Rasta and Tuga faced off against Kilian “Xexu” Pita and Jesus “Zidane10” Garnacho Navas. In the reversal of the Mexico-Denmark clash, the first leg was drawn 2-2 between Rasta and Xeru, before a 3-3 after Tuga and Zidane10 did battle. There was no luck for a winner in the deciding 2-2, and from the spot kick it was Portugal who triumphed in a 3-2 shootout win.